TORONTO - Francisco Liriano takes the mound tonight to begin a 3 game series against the Houston Astros. This will be Liriano's 2nd start for the Jays as a member of a newly created 6 man rotation. 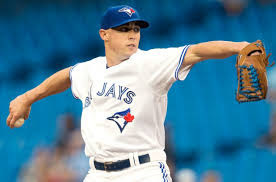 The Jays recently decided to leave Aaron Sanchez in the rotation after a season long discussion on when he should be moved out of the rotation and into the bullpen. The creation of a 6 man rotation by adding Liriano might be the safety valve that the Jays are looking for tho insulate their star right hander Sanchez.